Identifying sepsis symptoms early and delivering appropriate, coordinated care is the predominant guidance for improving its survival rates (sepsis contributes to nearly one in two hospital deaths). Integrated EHRs with embedded surveillance tools are able to detect slight changes in the patient’s condition and alert the care team, enabling clinicians to initiate sepsis bundles more swiftly. 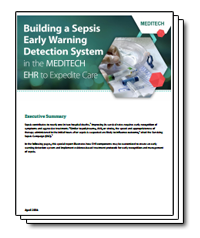 The solution consists of two parts: an early warning detection system that surveils and identifies patients who are at risk for sepsis, and clinical decision support tools that guide care teams as they deliver evidence­-based sepsis care. Surveillance capabilities continuously monitor real-­time activity, looking for patients who meet the sepsis profile’s criteria. An integrated EHR with an early warning detection system can automate two important processes: identifying the patient and alerting the care team. Sepsis Screening Algorithms: A sepsis screening algorithm determines the patient’s sepsis risk based on information documented in the EHR. MEDITECH provides two Surviving Sepsis Campaign-derived algorithms — an adult sepsis screening algorithm for global use and an adult sepsis screening algorithm for ED triage. Electronic Alerts: Innovative and actionable surveillance tools embedded in the EHR continuously analyze data based on the sepsis algorithms. Upon identifying a patient who meets the at­-risk profiles, surveillance tools generate electronic alerts, which reflect the patient’s most current status. Clinical Panel: A sepsis-­specific clinical panel presents a full and actionable picture of the patient to the physician. Data is displayed in a time-­oriented flowsheet, which aids in assessing, monitoring, and treating the patient. CPOE with Evidence-Based Order Sets: Providers who have well-­designed order sets at their disposal can be confident they are not missing critical warning signs and are following best practice guidelines for managing patients with sepsis. MEDITECH recognizes the ever-­changing nature of clinical best practices and grants providers direct access to the latest research through reference links to clinical knowledge databases. These databases support clinician decision making when reviewing files, ordering tests, and prescribing medications. Providers stay current with the latest research and make well-­informed treatment decisions, which contributes to improved quality of care and more predictable outcomes.